Fast growing melanomas can be fatal within a few weeks. In many instances patients do not have a chance to present to their doctor before it is too late. However if it is detected and treated early enough there is a chance that it can be cured. Slow growing melanoma can take months or years to grow before it becomes fatal. It is very often indistinguishable from a normal mole with a naked eye therefore careful skin examination to detect this type of skin cancer is very important. If you have regular skin checks no one should die from it. Another way of looking at melanoma is the same as any kinds of cancer, the most important factor to determine survival and prognosis is the stage of the tumour. Early melanoma such as melanoma in situ can be cured with a definitive surgical treatment whereas late stage melanoma can be fatal or associated with very poor outcome. Therefore it is vitally important to present to your doctor or specialized clinics such as our clinic if you have any concerns with your moles or any changes of your moles. Our aim is to make sure no one walks out of our clinic with an undiagnosed skin cancer especially melanoma. It is the commonest type of skin cancer and represents 65% to 80% of skin cancer. It occurs most commonly on the face and neck with raising incidence on the trunk in recent years. Appearances of basal cell carcinomas are often small round or flatten in shape and red, pale or pearly in colour. It typically affects individuals between the ages of 40 and 79 years. BCCs usually grow slowly but can become locally invasive and penetrate deeper tissue causing significant tissue destruction and disfigurement. Metastasis of this type of cancer is rare. SCC is the second most common form of skin cancer. It usually arises in an area that has had some premalignant change such as solar keratosis secondary to sun damage. There is a strong correlation with damage to the skin by the sun and can be experimentally produced by ultraviolet light. The appearances of these tumours are more inflammatory, indurated and ulcerate sooner compared with BCC. Australia has the highest prevalence of actinic keratosis also known as solar keratosis in the world. It affects 40 - 60% of the Australian Caucasian population over 40 years of age and 80% of those aged between 60 and 69 years. It is a premalignant condition often a precursor to squamous cell carcinoma (SCC). Its appearances are usually discrete, erythematous, scaly or crusty patches of skin and for that reason are often indistinguishable to SCC. They are either visible or subtle lesions clinically. Actinic keratosis is strongly associated with chronic sun exposure and sun burns and typically occurs on the face, scalp, arms, dorsum of hands and upper back. A vast majority of squamous cell carcinomas derive from AK. Therefore, anyone with multiple AK lesions should have regular follow up and be treated accordingly. As described above Actinic Keratosis can be difficult to distinguish from squamous cell carcinoma clinically. It is also very hard to differentiate from another benign chronic condition which is Lichenoid Keratosis as illustrated in the pictures shown below and above. In most cases a punch biopsy or total lesion excisional biopsy is necessary to confirm a clinical diagnosis as the treatment options for these conditions will depend on it. Dysplastic Naevi are high risk moles and have a high potential to progress to malignant melanoma. The appearance of these moles are usually irregular, uneven distribution of colour, raised or flat, large moles which share some of the features of early melanoma. They can be dark, brown or pink in colour. 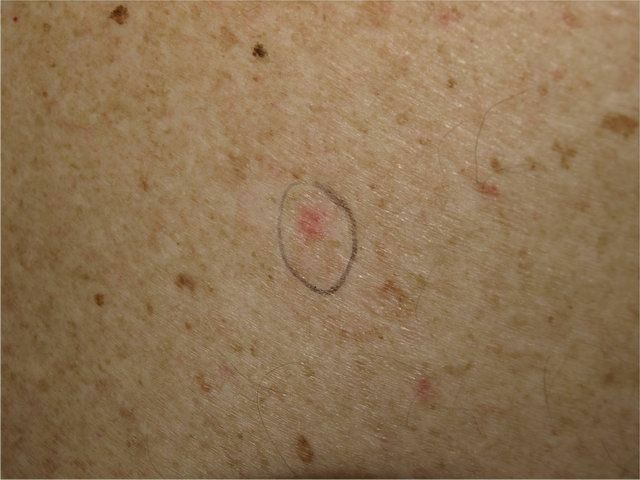 Management of these moles is either surgical excision for biopsy to exclude melanoma or close monitoring program to detect if any changes, which may suggest early melanoma. In the case of severely dysplastic naevi they should be treated as melanoma in situ and wider skin surgical excision is warranted. Dysplastic Naevus Syndrome (DNS) is diagnosed when a person has 5 or more of dysplastic moles and they need to be confirmed histologically. Patients with DNS usually have multiple moles which make management more difficult. Life time risk of developing melanoma in this group of patients is 40 to 47 times higher than general population. Therefore it is mandatory that everyone with DNS should be in a close monitoring program such as total body photography with digital monitoring and some of these moles should be removed and sent for histological confirmation to exclude melanoma. The single most important determinant of whether an individual is prone to develop melanoma or not, is the presence or absence of dysplastic naevi. There are numerous epidemiological studies that confirm the significant of dysplastic naevi as markers for increased risk for developing melanoma. Sun Protection - are you protected? UVB rays are responsible for sunburn and represent 5% of the UV rays on the earth's surface. UVA rays represent 95% of UV rays on the earth's surface and penetrate deeper into the skin than UVB. Unlike UVB which causes us to burn, UVA cannot be felt on the skin. Instead they accelerate skin ageing, can cause skin to become sun-reactive (redness, itching) and can affect the pigmentation of our skin (melasma, brown spots). The best sunscreen is therefore one that has both high UVA and UVB protection as both UVA and UVB rays can lead to the development of skin cancer in the long term. Not all sunscreen products are equal and for this reason it is important to know the differences. SPF specifies the ability to block UVB rays so two products with the same SPF may provide different levels of UVA protection and photo-stability. At Drummoyne Surgery & Skin Cancer Clinic we are proud to stock Anthelios products which offer the highest protection against both UVA and UVB rays. In fact, its UVA protection is almost twice that required by the Therapeutic Goods Administration. Produced by La Roche-Posay, it uses one of the most advanced filtration systems MEXOPLEX. Suitable for sensitive and sun allergy-prone skin, even those who dislike the feel of sunscreen may be surprised by its non-greasy texture and lack of strong smell.